Want to try out tiny living? Check out this rustic modern tiny house you can rent using Airbnb. It’s located in Portland, Oregon in a great area close to restaurants and shops. 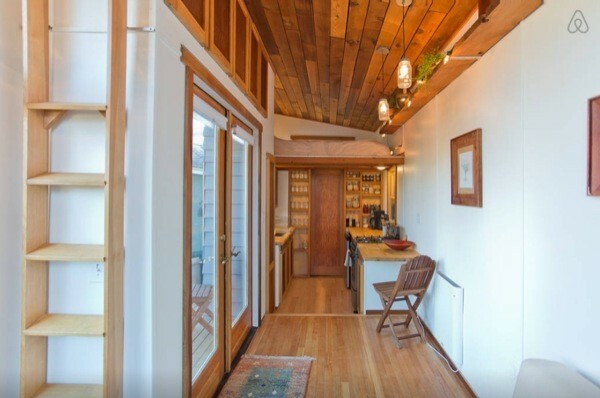 The owner’s built this tiny house using 80% reclaimed materials. Inside you will see there is a couch that unfolds to a bed in the living area with neat Mason jar lighting. The vaulted ceilings and large windows make this tiny house seem very spacious. The kitchen has lots of counter space and there is a stove/oven so you can prepare meals if you like. The bathroom is just beyond the kitchen. Up the ladder, above the kitchen and bathroom, you will find the sleeping loft with a cozy queen size bed. I love the way they decorated and used the wood on the celing to give this tiny home a cozy feel. There is a beautiful surrounding garden outside the tiny house. Please enjoy and share below. You can share this Rustic Modern Tiny House in Portland with your friends and family for free using the e-mail and social media re-share buttons below. Thanks. If you enjoyed this Rustic Modern Tiny House in Portland you’ll absolutely LOVE our Free Daily Tiny House Newsletter with even more! Thank you! in the back country..LOL. Thank you so much for sharing!!! I love the galvanized shower I’m a fan of that look and would sure love a galvanized tub too (in my permanent home) question, what is that line of door looking panels above the front door? Storage? Might be ‘Heating Panels” which give off a radiant type of heat from electrical cables inside of them. Wow! I really…love it! It is bright and airy and the kitchen is spacious compared to most THs. I would have to turn it down if given to me though if I had to occupy it. The ladder. (I know, the usual compliant for some of us 55+.) I was thinking if there was a ‘silo’ type structure, for a small spiral staircase, that would provide relief from climbing issues. I like the layout, and the comfortable seating area…but that loft is more than cozy. There’s no headroom at all up there. Wow, when you said that I thought, “Where IS the loft?” and then I found it. I would concur. Pretty small. But overall, this does look nice. I wouldn’t have inset the entry, space is too valuable… the only other problem is, it’s not mine! Yet another AirBnB, it seems like everyone is building tiny houses to get around tax laws or something, can there really be ‘guests’ enough for every backyard in America to have a tiny AirBnB in it? Getting around the tax laws? So that’s the singular purpose of “everyone” who is building tiny houses? Please examine your generalizations more thoroughly; you will see that there are MANY reasons people build, live in, or rent out tiny houses. We talk to more tiny house enthusiasts than anyone else on a daily basis, and the range of reasons why people decide to scale their lives down to a tiny house runs a wide range of reasons. The most touching to our company happened a week ago when a professional blues musician picked up his 28′ trailer from us and began to build his tiny house next to his rotting mobile home. He said his kid deserved a home that doesn’t let rain fall on them when they sleep, and he was tired of picking mushrooms out of the carpet. He couldn’t give a #@&* about tax dodging or income on a tiny house. He wants a safe and healthy place for his family, and this is how he can afford that. The spacious entryway would convert to a nice temporary dining room for entertaining. Nicely done. I say more power to everyone who “gets around” a few taxes. We have an unconstitutional institution extorting taxes from us and no one is benefitting more from that extortion than the @? !$&ing financial institutions who’ve rendered millions of former homeowners homeless. Yep, certainly does look Portland-y. Nice job on it. I love the kitchen- but hope no one falls into it. I love the homes, would like to scale back and have one of these. I really like the overall design… Especially with the recessed entrance. Is this actually a THOW?